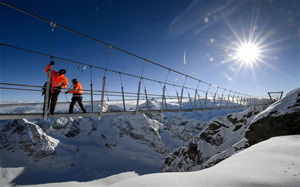 Engineers have constructed the 300ft-long pedestrian bridge at 9,977ft above sea level on Mount Titlis in central Switzerland. It has been built to mark the centenary of a cableway that connects two nearby towns, Engelberg and Gerschnialp. The cableway began operating in January 1913. Entrance to the 3ft-wide bridge, which cost 1.3 million Swiss francs ($1.45 million) to build and will offer views of a 1,600ft deep abyss, is free. It opened on Dec 7. “Europe’s highest suspension bridge will allow us to bring guests a step closer to the Alps and let them experience the height, vastness and majesty of the mountains from the most impressive of platforms,” the local tourism authority said on its website. Heavy snowfall may force the closure of the bridge for a few days at a time, engineers said. “Undertaking construction work at [9,977 feet] above sea level is extremely challenging and the ability to keep to a schedule is determined largely by the weather,” the Titlis tourism association said. The steel and concrete needed to construct the bridge was transported to the top of the mountain by cable car and helicopter. Kiam Moriya of Hoover, Ala., turned 12 last week — on 12/12/12. Tomasz Paczkowski from the northern Polish town of Elblag now sports bandages around his head after a request from his wife to help with the housework while he enjoyed a few days off work backfired. “My wife had gone to work and asked me to help with the housework,” the 32-year old told the Polish newspaper Fakt. “After breakfast I started to work. I turned on the boxing channel on the TV, opened a beer and started ironing. Mr Paczkowski said a burning sensation on his ear soon made him realise his mistake. To compound his misfortune a dash to the bathroom to cool his burn with water resulted in his head hitting a door frame, causing an injury just above the left eye. As a result of his accident he said he would give up watching boxing on the television but would continue to iron. If a tree falls without a permit in Texas, who pays the penalty? An Austin property owner faces hefty fines for clearing dozens of dead trees from his property without city permission — even though he was doing so to prevent a fire hazard. Charles Attal must plant new trees or pay up to $2,000 per sapling. Cottage Grove, Minn., resident Chris Burd, 27, discovered last year that the Santa Claus he visited at a Minnesota mall as a child in 1998 was the father of the woman he married. The coincidence came to light when someone dug up the picture of Burd’s childhood visit to Santa. Chris was 13 at the time, and says he only went to the mall to appease his 3-year-old sister.